Can you believe it's already time? What is a Scrapbook Rodeo you are asking? Well partner, it’s like this. It’s two full days of rootin’, tootin’ fun while you scrapbook with your fellow cowpokes. We’ll bring in the best vendors from near and far to sell their wares or if you’d like, you can hitch up your horse and mosey on over to the OK Corral for some of the best classes this side of Texas! All while kicking up your heels and whoopin’ and hollering over awesome prizes and gifts sure to make every cowpoke grin!! That not enough for you? Well then partner, make sure you stick around to see the Saloon Show on Saturday night! It’s guaranteed to tickle your funny bone! Never fails, I always think after each crop that the next one simply can't get any better than they go and prove me wrong!! We had over 65 ladies join us for two full days of cropping, pampering and laughter! We raised a ton of money for breast cancer, gave away a ton of prizes and even got everyone up and out of their seats to meet new friends. What can get better than that? We raised almost $200.00 in loose change and the above bras were the 1st, 2nd and 3rd place winners in the decorated bra contest! Lots of prizes given out!! Meeting new friends is one of the best parts of attending a crop! Ahh...the Diamond Cuts girls were back to pamper us with pedicures, foot detox and paraffin hand waxes. No worries, they'll be at the November crop offering even more services! If you attended Scrap Pink, thank you from the bottom of my heart!! If you were unable to, we missed you and hope to see you soon!! 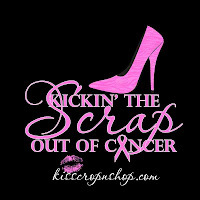 Registration will end at midnight tonight for all Scrap Pink T-Shirt orders! Remember you do not need to attend Scrap Pink to order your shirt and help fight a great cause, Breast Cancer!! Check out order details at http://www.kisscropnshop.com/shopping. Scrap Pink Crop registration will also end tonight however we do have a few seats left. If you are interested in attending please email me at info@kisscropnshop.com. Registration after midnight tonight will not be guaranteed a door prize but will be able to participate in many of the contests, games and other fun activities! !